In this Photoshop Effects tutorial, we'll learn how layer blend modes make it easy to add a popular lens flare effect to a photo without making any permanent changes to our image. We'll start by adding the lens flare normally to position it exactly where we want it, then we'll undo the effect, add a new layer, re-apply the lens flare instantly using a handy keyboard shortcut, and finally, we'll blend the lens flare into the image using one of Photoshop's most common and widely used blend modes. The final lens flare effect. Go to Filter > Render > Lens Flare. 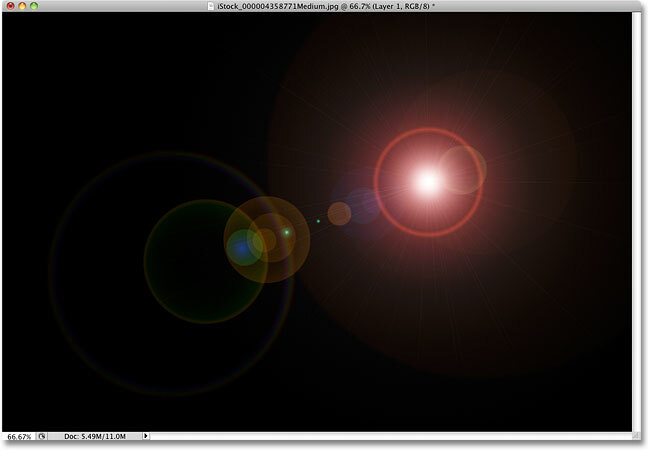 This opens the Lens Flare dialog box. 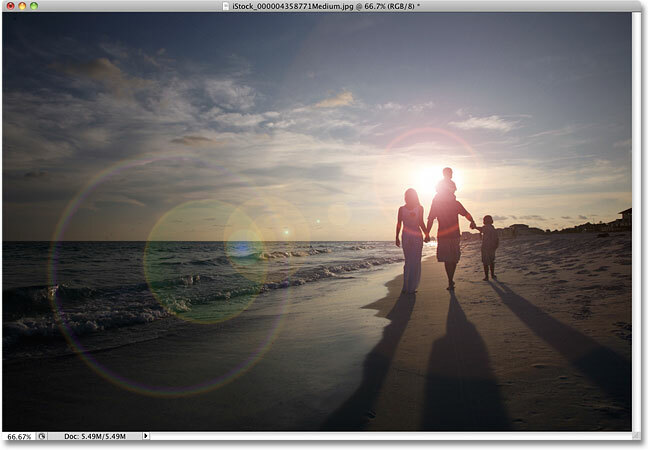 Photoshop's Lens Flare filter adds a simulated lens flare effect to the image, and we can choose from one of four different types of lenses (50-300 mm Zoom, 35mm Prime, 105mm Prime, and Movie Prime) in the Lens Type section at the bottom of the dialog box. Each one will give us a different type of flare. Select each one to view the effect in the preview area in the top half of the dialog box. I'm going to stick with the default 50-300mm Zoom lens. You can also adjust the brightness of the lens flare by dragging the Brightness slider left or right, but again, I'll stick with the default 100%. 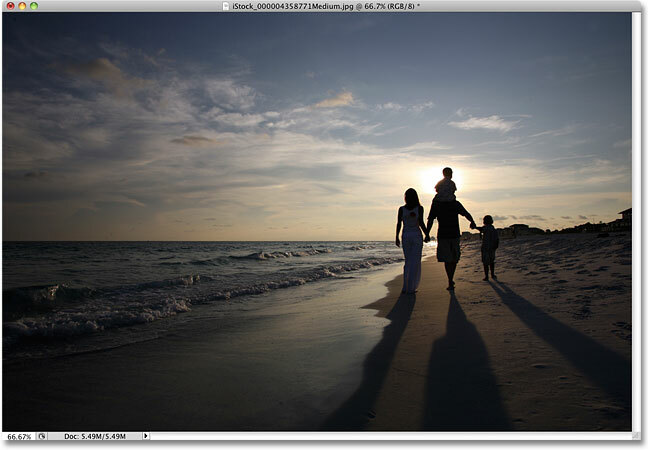 Click inside the preview area to set the position of the lens flare. The initial lens flare effect. The only problem is, we've just applied the lens flare directly to the image itself. If I was to save the image at this point and close out of it, the original photo (without the lens flare) would be gone forever, and that's not the way you want to work in Photoshop, especially when we can create the exact same effect non-destructively using blend modes! Go to Edit > Undo Lens Flare, or press Ctrl+Z (Win) / Command+Z (Mac). Add a new layer above the Background layer. Set Black as the color you want to fill the layer with. Click OK to exit out of the dialog box. Photoshop fills the new layer with black, which fills the document window with black, temporarily hiding the original photo from view. The previously used filter always appears at the top of the filter menu so we can re-apply it easily using the same settings. Space. The final frontier. These are the... oh, uh, sorry about that. Change the blend mode for Layer 1 to Screen. The same lens flare effect has been applied without harming the original photo. Click the layer visibility icon to show or hide the lens flare in the document window. Lowering the opacity of Layer 1 reduces the intensity of the lens flare. A more subtle flare effect. Make sure you save the image as a Photoshop .PSD file when you're done to keep the layers intact in case you ever need to go back to the original image without the flare effect. And there we have it! That's how to add a lens flare effect to an image non-destructively with Photoshop! Visit our Photo Effects section for more Photoshop effects tutorials!